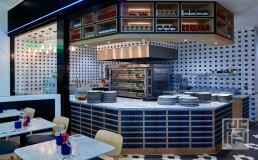 Our brief was to provide a new Pizza Express venue in the White Rose Shopping Centre Leeds that was fun and family focussed. 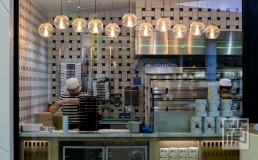 The new restaurant, inside the White Rose shopping centre, had to be family focused and needed to include unique design features that captured the character and heritage of the local area. It was essential the new restaurant really stood out amongst the other well known restaurant brands in the centre and offered customers a great dining experience. The design concept was influenced by the textile and cloth manufacturing industry associated with Leeds and this region of West Yorkshire. 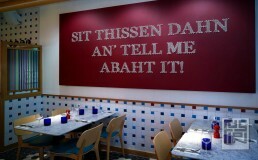 Key design elements that are featured within the restaurant take reference from materials and pattern associated with textiles and cloth manufacture, the space also demonstrates an element of fun with a stand out piece of artwork influenced by Yorkshire slang and dialect.